Our online appointment system for one-on-one and small group mentoring is now open. Welcome to the Murty Sunak Quantitative and Computing Lab. We are located on the lower level of the Kravis Center. The QCL supports the integration of computer and data science into the full range of liberal arts disciplines: the social sciences, sciences, and humanities, helping students apply quantitative reasoning skills to any discipline, from economics to government, from biology to philosophy. 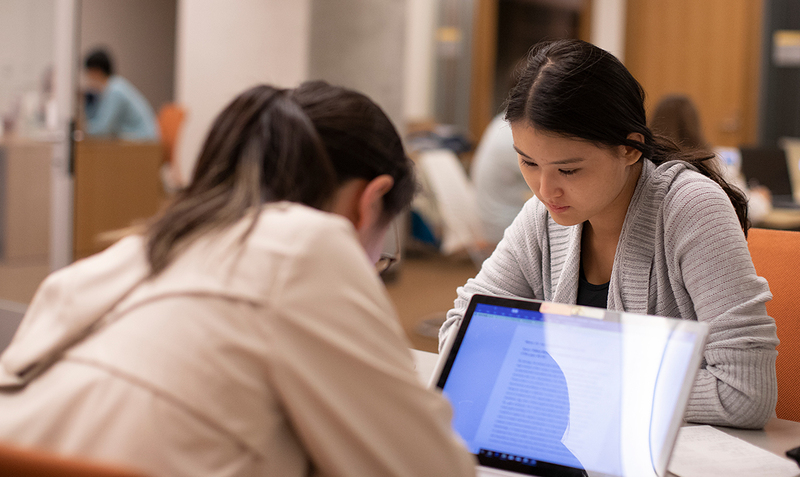 Our staff provides one-on-one support and tutoring so students can learn how to incorporate data into research papers or other academic projects, as often requested by professors. We also help students understand the programming language of data so it’s less intimidating and show them where to find the best sources of support information to elevate the quality and clarity of their analyses. Given modern workforce requirements—where data has infused itself in everything from political analysis and business dynamics to sports analytics—QCL aims to make data and quantitative skills accessible to students from all backgrounds, including those traditionally underrepresented in quantitative and technology fields. The QCL will provide both introductory and high-level services to support the expansion of interdisciplinary computer science and data science for all students at CMC. Academic support (tutoring and advisory): The QCL will provide regular tutoring for a wide range of courses that require quantitative and computational mastery. Quantitative consulting services for advanced student and faculty projects (research, innovation, and student enterprise): The QCL will provide direct support and consulting services for advanced student capstone projects, senior theses, faculty research projects, student businesses, social enterprises, public analytic projects through the policy lab, and other advanced activities. Targeted training and workshops: The QCL will organize workshops on quantitative and computational tools of interest to students and faculty, such as exposure to Artificial Intelligence, robotics, and machine learning, training on statistical methodologies, or mathematical modeling. Built as an open space tutorial center, the QCL is available to students on a drop-in basis and by online appointment. It is led by QCL director Jeho Park, who holds a Ph.D. in Applied Mathematics and Computer Science from Claremont Graduate University. Prior to joining CMC, Park served as Associate Director of Academic Research Computing Services at Harvey Mudd College.